Changes at the airport could help protect communities downstream. 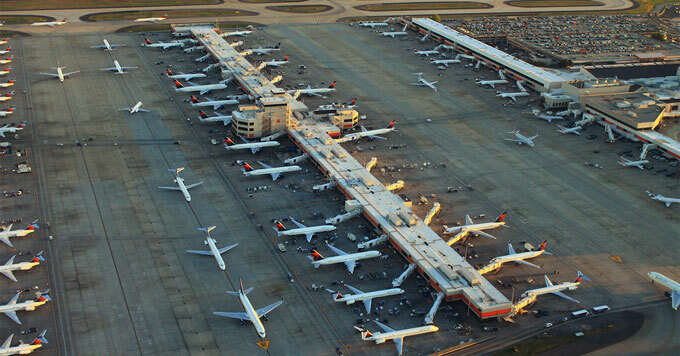 Beneath the runways of the world’s busiest airport, hidden streams run underground. That’s senior sustainability planner Polly Sattler. She says that when it rains, storm drains and gutters rapidly shunt stormwater away from the airport into the river. But sending water downstream so quickly can worsen the effects of drought. And during big storms, it can cause flooding. The Flint is a valuable water source for Georgia and feeds watersheds downstream. So as droughts and storms become more severe, the airport is taking action. There’s no way to avoid the need to get water off the runways quickly. But where it’s safe to do so, Sattler says the airport is installing porous pavement and drainage areas filled with vegetation. So while planes come and go above, the water below will seep slowly into the ground and flow more gradually to communities downstream.